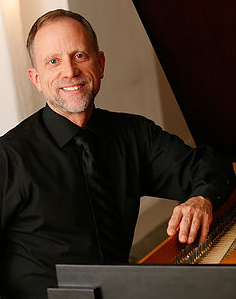 Keyboardist Donald Livingston collaborates with musicians from across the musical spectrum. Founding director of the Twin Cities Early Music Festival and director of Ensemble Sprezzatura, he has performed with such ensembles as Bach Sinfonia (Washington DC), Musica Antigua (Panama City), La Donna Musicale (Boston) and others, as well as with soloists and collaborators Cléa Galhano, Immanuel Davis, Jacques Ogg, Barthold Kuijken, and Dame Emma Kirkby. He has sung as a member of the Rose Ensemble, as well as with the Pro Arte Singers under the direction of Thomas Binkley and Paul Hillier at Indiana University. He is currently organist at St. Martin's Evangelical Lutheran Church in Austin and Lecturer of Organ and Harpsichord at the UT Butler School of Music. Aside from musical endeavors, Livingston holds the Juris Doctor degree from the Mitchell-Hamline School of Law, where his studies focused on copyright, entertainment and art law, and where he was a recipient of the CALI Award for Entertainment Law.